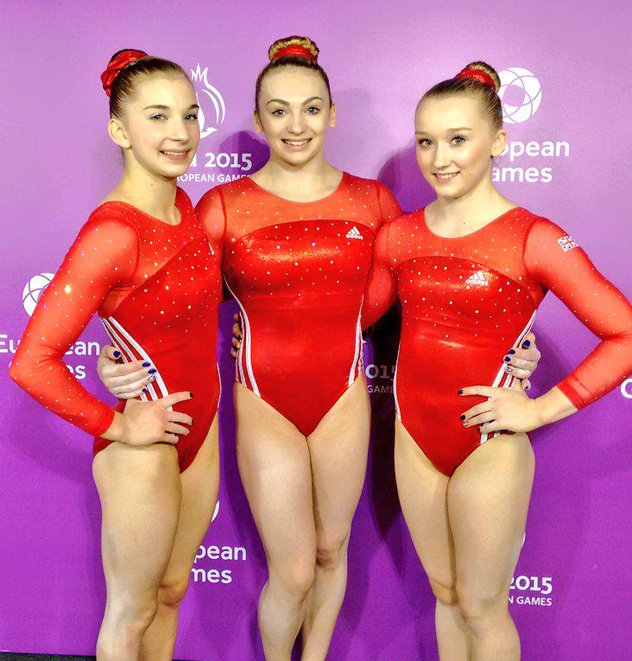 Day two for the GB gymnasts in Baku, and again a day of mixed fortunes for all three girls. Just before getting onto the actual gym, I’m taking a moment to mention the absolutely beautiful leotards the girls have worn over the last two days. I especially liked yesterdays Union Jack in rhinestones, and am wondering whether we’ll see a red version in finals. I’m kinda hoping that Milano have something similar planned for worlds. Today saw the team compete on beam and floor to add to their total from the first two pieces yesterday. Starting on beam, Charlie had one of those days where it just didn’t go her way, although it was very much a routine of two parts. Falling on her front somi mount, Charlie didn’t regain her composure before moving onto the split leap to free walkover which saw her come away from the apparatus again. It is a testament to Charlie’s determination that she recovered well and strongly performed the rest of her skills and choreography, with some gymnasts after a hard start, the head goes down, and the rest of the routine is lackluster, Charlie performed as you should when representing your country, with pride and determination to do the best job possible. Change- change 1/4, great flick layout without a flicker on landing, and a fantastic and nailed flick to one- flick to two- double tuck dismount. Kelly put in a fighters performance on beam today, starting with a solid change-change 1/4, on to her flick layout to two feet with a fight on the landing, but she was clearly determined to bring it under control. She fought the landing again on her front, then was solid on the change half. Just landing with the shoulder slightly dropped on the back tuck, Kelly pulled herself back in line, competitive experience showing well. Good free walkover, no full in dismount today, but a strong double tuck finish instead. What was really impressive as well as her determination to stay on was the improvement in attack on this piece for Kelly, she worked quickly and sharply through the routine giving the air of confidence that good beamers learn to maintain whether you are hitting everything or not. I love it when a prediction comes true, I said that Georgie had a good chance of making the beam final with a hit routine, and that’s exactly what she did. Safely through her lovely free cartwheel-layout acro series, free walkover-change leg- change 1/4 confidently connected, change half, and one of the nicer side somis out there as she’s straight legged for a lot longer than most gymnasts, and really only bends the trailing leg which is far more aesthetically pleasing. The routine flowed well throughout, kept moving and was performed with confidence, Georgie is fast becoming a big occasion beam performer. A good double tuck with just a step on landing finished a great routine for 13.833. On to floor, and Georgie started the team off well with a new routine set to a lovely Spanish themed piece of music. Tumbling a high double arabian with just a step on landing, a two and a half twist to punch front with another step on landing, but she managed to keep it under control and in the area. A double tuck with a bounce out, then a good switch full-split jump. Double pike to finish, a little too much power again, but a good lead off routine for the Brits. Charlie did what good gymnasts do, left the last piece behind her and moved on to the next. Opening with a high piked full in, and tumbling back with a stuck whip to double tuck, she was off to a great start. Expressive dance well performed, through the leap series, and on to one and a half through to double twist. Beautiful change leg half, and finishing with a high double pike needing a large step to bring in under control just at the end. 51.798 AA for Charlie. Kelly closed the team competition for the British girls on one of her strongest pieces, absolutely nailed double straight to open, back with the new whip to full-in well performed. The split full in the leap series will have cost her a bit in terms of not hitting her split today, and a little loose in the feet. Third tumble, one and a half to double tuck was a little low on landing with a hop forward, kelly hit a lovely Popa, then finished with a high double pike with just the hop on landing. Five gymnasts scored 13.600, and two of them made it into the final. Unfortunately Kelly missed out today due to E score being the deciding factor, she is placed as first reserve. Kelly won the AA battle and progresses to the final on Thursday, as well as competing in the Vault final on Sunday. Georgie will also compete on Sunday in the beam final. Well done girls, and good luck for finals!